The Earth is flat, the World Trade Center collapse was a controlled demolition, planes are spraying poison to control the weather, and actors faked the Sandy Hook massacre…. All these claims are bunk: falsehoods, mistakes, and in some cases, outright lies. But many people passionately believe one or more of these conspiracy theories. They consume countless books and videos, join like-minded online communities, try to convert those around them, and even, on occasion, alienate their own friends and family. Why is this, and how can you help people, especially those closest to you, break free from the downward spiral of conspiracy thinking? 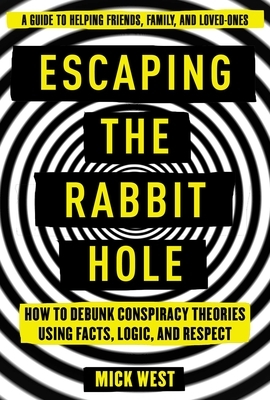 In Escaping the Rabbit Hole, author Mick West shares over a decade’s worth of knowledge and experience investigating and debunking false conspiracy theories through his forum, MetaBunk.org, and sets forth a practical guide to helping friends and loved ones recognize these theories for what they really are. Perhaps counter-intuitively, the most successful approaches to helping individuals escape a rabbit hole aren’t comprised of simply explaining why they are wrong; rather, West’s tried-and-tested approach emphasizes clear communication based on mutual respect, honesty, openness, and patience. West puts his debunking techniques and best practices to the test with four of the most popular false conspiracy theories today (Chemtrails, 9/11 Controlled Demolition, False Flags, and Flat Earth) — providing road maps to help you to understand your friend and help them escape the rabbit hole. These are accompanied by real-life case studies of individuals who, with help, were able to break free from conspiracism. Mick West has put forth a conclusive, well-researched, practical reference on why people fall down the conspiracy theory rabbit hole and how you can help them escape. Mick West is a science writer and professional debunker. While he began his career as a video games programmer, his primary focus at the moment is investigating and explaining conspiracy theories such as Chemtrails, 9/11, False Flags, etc. He also covers more esoteric topics such as UFO’s, pseudoscience, Flat Earth, photo analysis, and other quackery. Mick has appeared on numerous major media outlets, including CNN, CBS This Evening, the Joe Rogan Experience, and many others.